A closed group has been formed specifically for the our class. The idea is to promote communicaton between classmates and get in touch with as many as possible. You can find it at "Dundee Community High School Class of 1969". Anyone can find this group but only members can see who is in it and what they post. Please invite any of your Facebook friends who are class members. 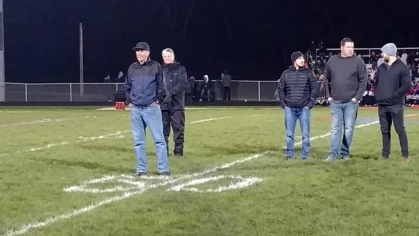 Congratulations are in order for Larry Pedley, who has been elected to the Dundee-Crown Athletic Hall of Fame. Larry was quarterback for the '69 team, setting many passing records in route to guiding the CarDunAls to a co-conference championship in the North Suburban League. He was also a member of the basketball team. Joe Campanelli from the class of '65 was also inducted that evening. Visit the Dundee-Crown Athletic Hall of Fame on Facebook for more information. 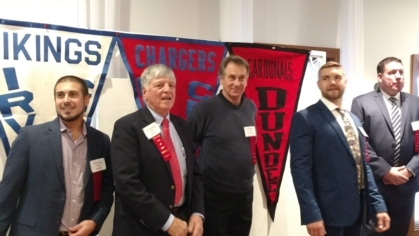 The induction ceremony and dinner was held on October 13, 2018 at the Golf Club of Illinois. There was a table of Class of '69 classmates to cheer Larry on. Coaches Johnny Paul and Paul Judson were there also, as was Gerry Courriveau and Jim Rumsa. Thanks also to Bob Whitehouse who was instrumental in founding the Athletic Hall of Fame and is still very active with the organization. More pictures can be found on the Facebook page listed below. encourage you to JOIN TODAY! Use the POP-OUT Player for continuous play while browsing the site.